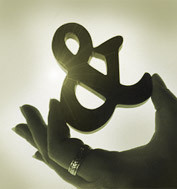 Ampers& Studio: What is an Ampersand? of the phrase and per se and. style variations of this fascinating character exist. and attention to detail are very important to us. You see, we love type (and good design, too). for getting your message across effectively and aesthetically. graphic design and typography since 1986. Please take a moment to browse our site.